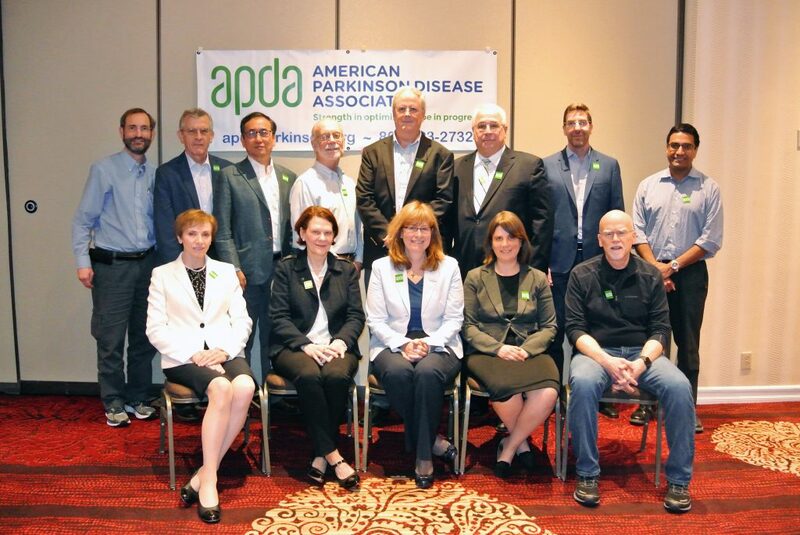 NEW YORK, NY, May 24, 2018 – The American Parkinson Disease Association’s (APDA) Scientific Advisory Board recently met to review 70 grant submissions all vying for funding to be awarded in the field of Parkinson’s research. In addition, the Scientific Advisory Board (SAB) reviewed proposals for new APDA Centers of Advanced Research, to be located at academic medical centers across the United States that have proven themselves as leaders in Parkinson’s disease (PD) research. Final funding decisions will be announced in August. APDA Scientific Advisory Board: (Back row L-R) Joel S. Perlmutter, MD, Washington University School of Medicine; Dennis W. Dickson, MD, Mayo Clinic, Jacksonville; Un Jung Kang, MD, Columbia University College of Physicians and Surgeons; Richard Myers, PhD, Boston University School of Medicine; David G. Standaert, MD, PhD, Chairman of the APDA SAB, University of Alabama at Birmingham; Patrick McDermott, Chairman, APDA Board of Directors; Clemens R. Scherzer, MD, Harvard Medical School and Brigham & Women’s Hospital; Vivek K. Unni, MD, PhD, Oregon Health & Science University. (Front row L-R); Mary Maral Mouradian, MD, Rutgers Robert Wood Johnson Medical School: Marie Hélène Saint-Hilaire, MD, FRCP (C), Boston University School of Medicine; Leslie A. Chambers, President & CEO, APDA; Rebecca Gilbert, MD, PhD, VP and Chief Scientific Officer, APDA; J. Timothy Greenamyre, MD, PhD, University of Pittsburgh Medical Center. (Not pictured); Mahlon R. DeLong, MD, Emory University School of Medicine; Laura Marsh, MD, Michael E. DeBakey VA Medical Center; Jill L. Ostrem, MD, University of California San Francisco; Evan Yale Snyder, MD, PhD, The Burnham Institute. APDA’s mission is to provide the support, education, and research to help everyone impacted by PD live life to the fullest and as such, focuses on advancing scientific research that will be impactful and support this mission. “The only way to push the field of Parkinson’s disease research forward is to invest research funds to support new and promising ideas, as well as investigators with a long-term commitment to PD.” commented Dr. David G. Standaert, Chairman of the SAB. APDA grants fall into several categories. Post-Doctoral Fellowships are awarded at $35,000 per year, while Research grants are awarded at $50,000 per year. Additionally, the prestigious George C. Cotzias Fellowship is a $240,000 grant given over three years to support promising young physician-scientists who are rising stars working to establish their careers in PD research, teaching, and patient service. APDA Centers for Advanced Research receive $100,000 per year to support PD research activities. SAB Members work diligently to determine which grants will be recommended for funding. In addition to the members of the SAB whom have been committed to APDA for numerous years, two new members joined the SAB this year: Jill Ostrem, MD, Professor of Neurology at University of California, San Francisco, and Vivek K. Unni, MD, PhD, Assistant Professor of Neurology, Oregon Health and Science University, and the 2016-2018 recipient of the George C. Cotzias Fellowship. Each SAB meeting is also an important opportunity for updates on previously-funded research. In addition to the discussion of new research grants, Dr. J. Timothy Greenamyre, Director of the APDA Center for Advanced Research at the University of Pittsburgh, updated the SAB on the APDA-funded research being conducted at his institution. He focused on a gene therapy trial which is currently underway, in which the gene for Aromatic amino acid decarboxylase (AADC), embedded within an engineered virus, is introduced into the basal ganglia part of the brain in order to increase the efficiency of conversion of levodopa to dopamine. He also discussed leucine-rich repeat kinase 2 (LRRK2), a known genetic contributor to the development of PD, and presented data that this molecule plays a role in PD even in people who do not have a LRRK2 mutation. This critical research funding is only possible due to the financial support from APDA’s steadfast supporters and the dedicated work of the SAB who gather on a regular basis to review and recommend funding the most cutting-edge projects.